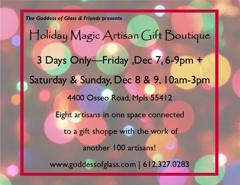 Retail Boutiques, Pop-Ups, Galleries, Holiday Parties, Food, Music and more from Black Friday to New Years Day! 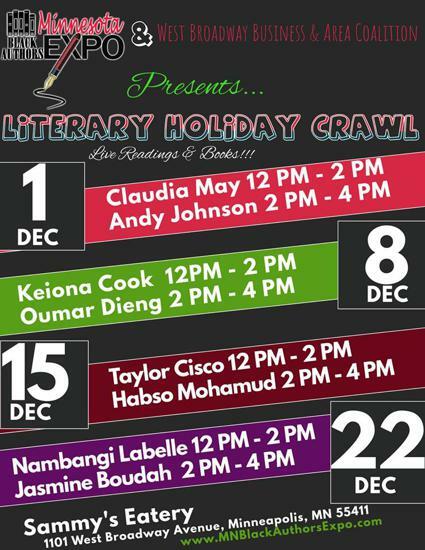 Dec 1, 8, 15, 22nd from Noon-4pm the Minnesota Black Authors Expo presents live readings and books from local authors, sit back with a delicious latte and get literary! 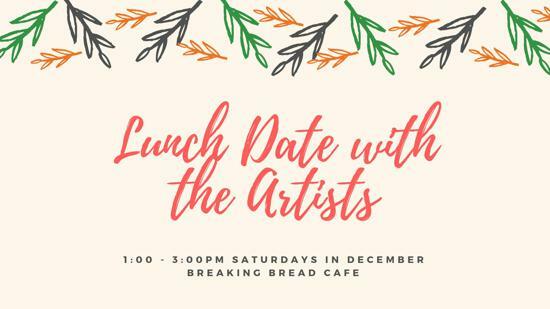 Dec 1, 8, 15, 22nd from 1pm-3pm Breaking Bread is hosting Artists lunches. Get to know local visual artists on the Northside and purchase their art! 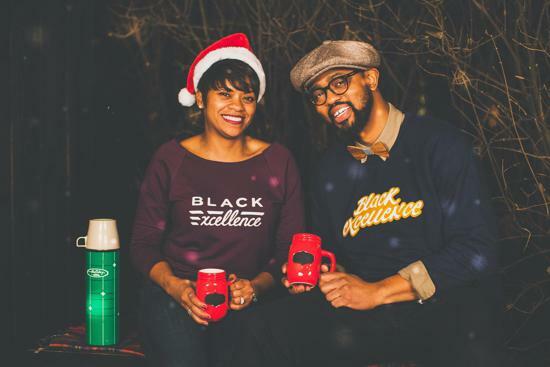 #ShopJXTA this holiday season! 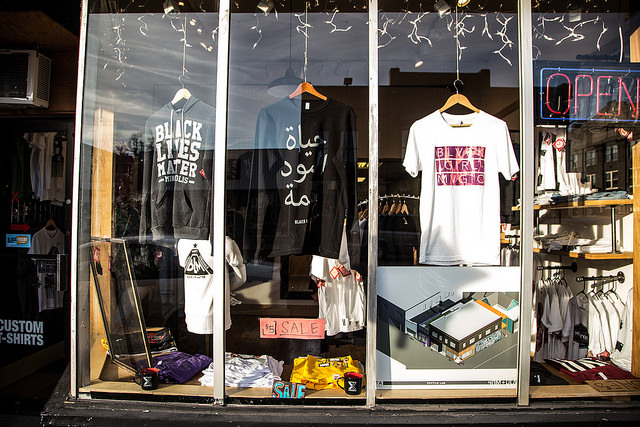 Shop unique, LIMITED-EDITION ceramics, t-shirts, baby apparel, and other gifts designed and crafted by by JXTA youth apprentices. 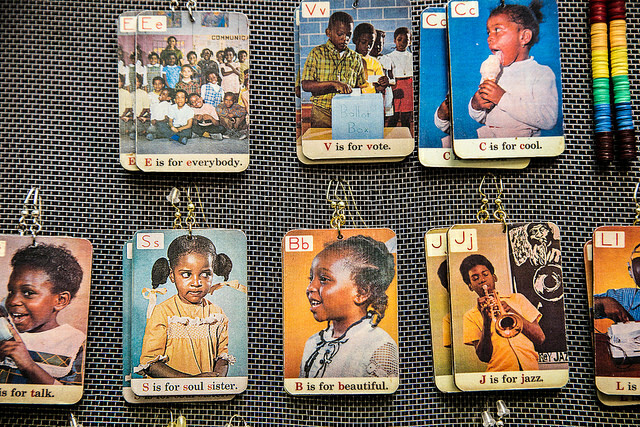 Stop by the holiday pop-up shop in the gallery in the month of December to buy gifts directly from our youth artists. Support the next generation of local artists. 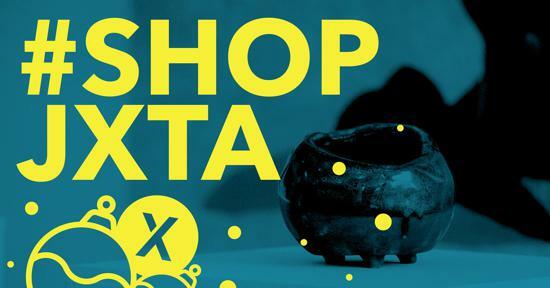 #ShopJXTA. A high energy and fun dance party where you'll lose between 600 to 800 calories for an hour and have amazing fellowship! Dance to Reggae, Hip-Hop, Salsa, Meringue and Afro beats! Bring a towel and a bottle of water. 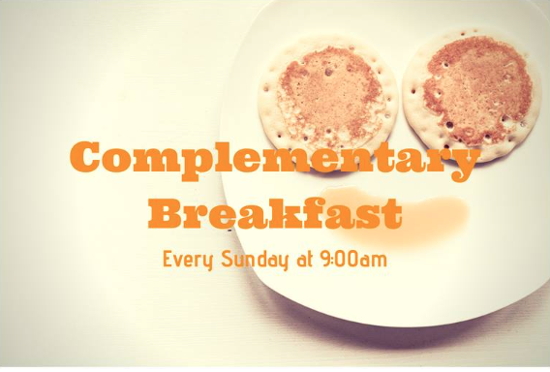 - Shiloh Temple International ministries will be having free breakfast at 9:00am every Sunday in The Glory Cafe area. - Shiloh Temple International ministries will be having free breakfast at 9:00am every week in The Glory Cafe area. All are invited to come and fellowship before Sunday School and the 10:45am Service. 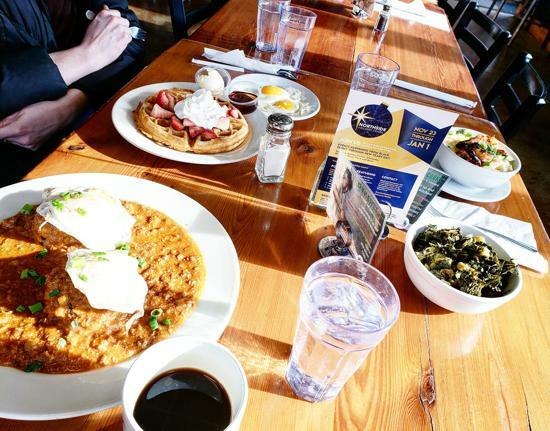 *Breakfast items may vary. 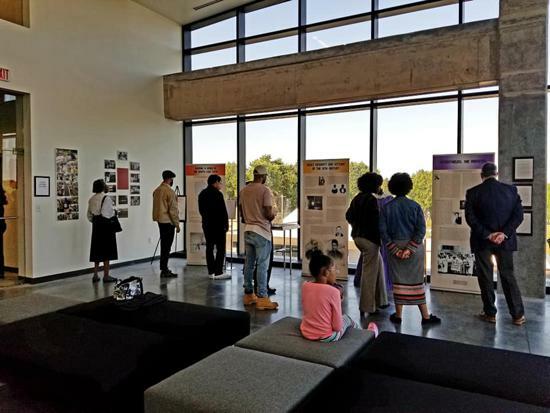 - "Unbreakable: Celebrating the resilience of African Americans in Minnesota" and "GRACE"
An art exhibit featuring photography from Walter Griffin and paintings by Beverly Tipton Hammond, both local artists. An opening reception will be held November 1. The artists will be present and will have works for sale. Admission is free. The exhibit runs from November 1, 2018 through January 31, 2019.
inside the Regional Acceleration Center (THOR building). - Shop Northside Holiday Boutique: "Holiday Fashion"
- 5th Annual Winter Warmth "Give Back to the Community"
- Shop Northside Holiday Boutique: "Handmade Holiday"
- Shop Northside Holiday Boutique: "Stocking Stuffers"
- Shop Northside Holiday Boutique: "Last Minute Gifts"
Introducing their new holiday packages - hand-packed gift boxes featuring Cookie Cart cookies with the option to add Peace Coffee and their signature blue Cookie Cart mug! 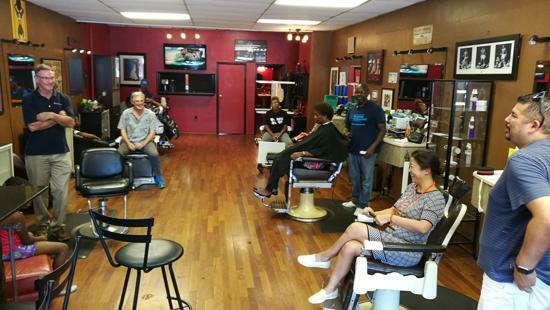 Stop by Wilson's Image for hair cuts, eyebrow threading and retail. Offering woman and mens clothing from his Up Your Image brand. Offering hand made bracelets, necklaces, etc. 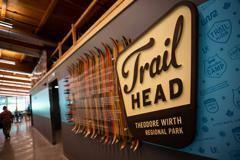 Stop by HWMR for haircuts and retail items. 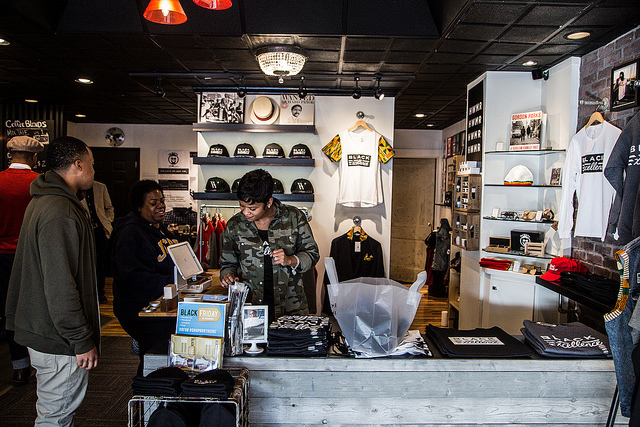 Offering woman and mens clothing and goods from their Be the Change, Black Excellence, HWMR Classic and SMaRT Art collections. 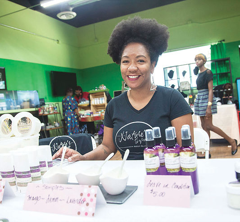 Offering natural Whipped Shea Butters, soaps, sugar scrubs and other natural care products. 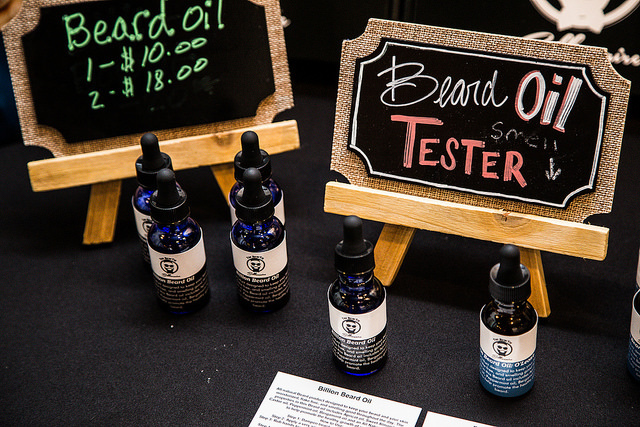 Offering all-natural Beard Oil and other mens grooming items. Holiday specials include Sweet Potato Pound Cake, My Fathers Bean Pies, and other specialty deserts. Check Facebook page on Black Friday for specials every hour on the hour. 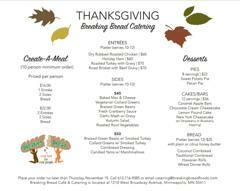 Breaking Bread Cafe and Catering is OPEN with EXTENDED hours on Black Friday and Small Business Saturday to kick off the Northside Holiday Crawl! Featuring gift cards and New Holiday Latte' Flavors! Egg Nog and Caramel Pecan. 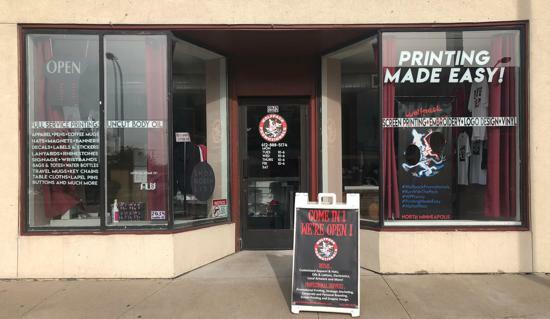 Shirts, hoodies, mugs and promotional gear - off the rack and custom made for you - featuring Alpha Wear BE and Bones Clothing, NorthMPLS. 100% uncut scented body oils. Large and small scale promotional printing of every kind. 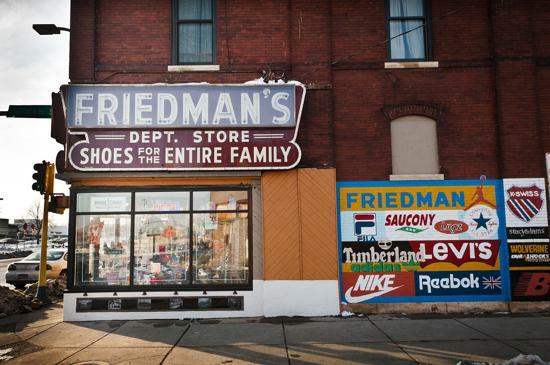 Stalwart 19th-century store with casual, athletic & street-style footwear & apparel for the family. 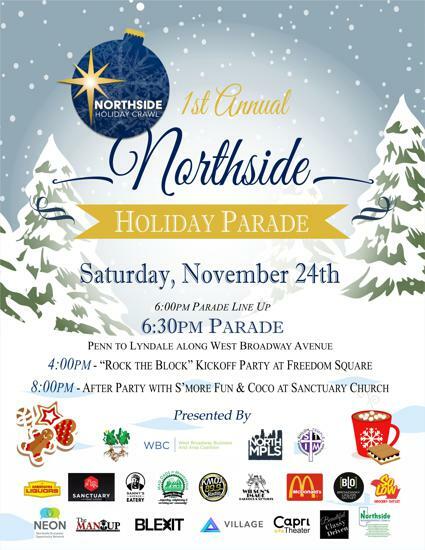 The 1st Annual Northside Holiday Parade is Saturday, November 24th! Offering Retail Floral Service, Gifts, and Baked Goods. 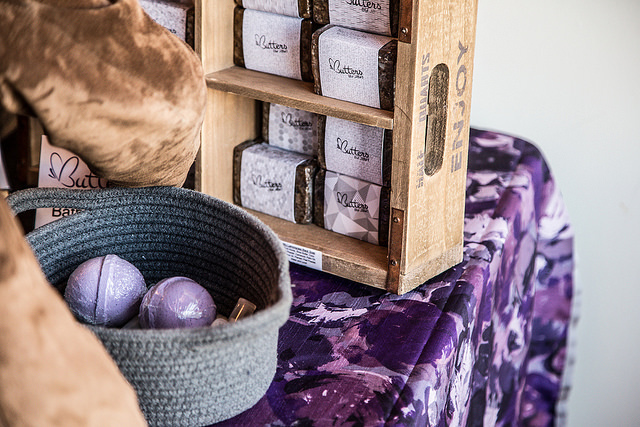 Offering art and handmade soaps. 100+ local artists on display. Look for specials and giveaways throughout the season! 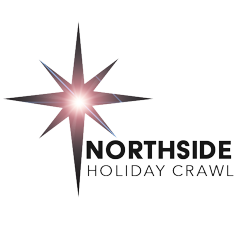 Northside Holiday Crawl Kick starts on Black Friday and Small Business Saturday! Offering Aromatherapy, bath and body products (Bodybutters, scrubs, lip balms, sprays, spa 2 go boxes). 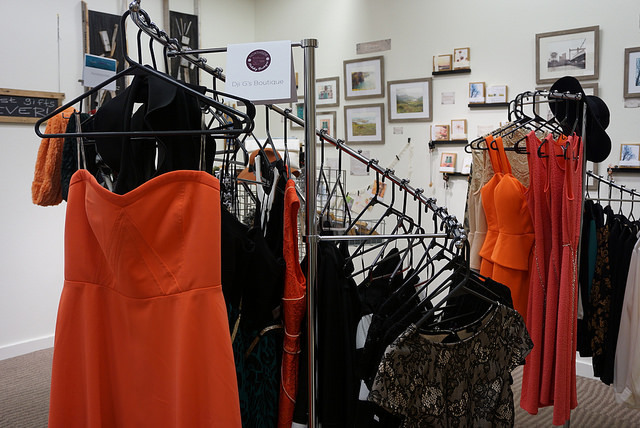 Offering Womens Fashion Forward Clothing. 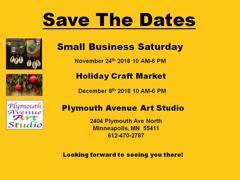 Offering Books(Adults & Youth), Body & Haircare Products, Jewelry, Clothing, Consultations on Branding and Digital Commerce for Entrepreneurs, Promotional Materials for Afrocentric Education resources in the Twin Cities. Offering Real Nail Polish Strips. Offering Fashion Accessories (jewelry, handbags, shoes, hats, scarves, bracelets, earrings, body jewelry etc). Offering feather earrings, scarves, hats and bracelets. Offering books, stones, crystals and african art. Offering T-shirts, Hoodies, ceramics, leatherworks, and other hand crafted items made by youth. Offering Color and Play Piano Coloring Books. Offering Scandinavian Apparel: long sleeve and short sleeve shirts. Offering Natural skin and hair care products. Offering All natural bath and body, nail polish, tshirts, jewelry, and gift sets. Offering Pure oil incense, body oils, and creams. Offering T-shirt’s, Water bottles, bags etc. Offering Brazilian Indian Mink Malaysia Hair Bundles, Take Over Edge Control & Mink Lashes, and Take Over Clothing Line. Offering Lipstick, eyebrow wax, eyelash strips, etc. Offering All natural edible body scrubs, lip balm, body budder, soap. Offering Ready-to-wear African Prints for Men and Women. Offering Books, Journals, Professional Speaking & Coaching. Offering Hot dogs, polishes, chips, soda, water. Offering Detox tea, weight loss tea, fat burning cream, waist trainers, sauna sweat vest, and waist trimmer sports belt. 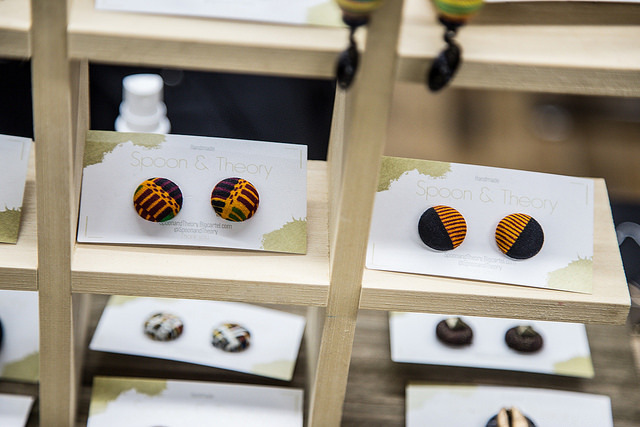 Offering Handmade accessories for all along with organic aromatherapy goods. Offering t- shirts and mugs. Offering Cupcakes and other treats. 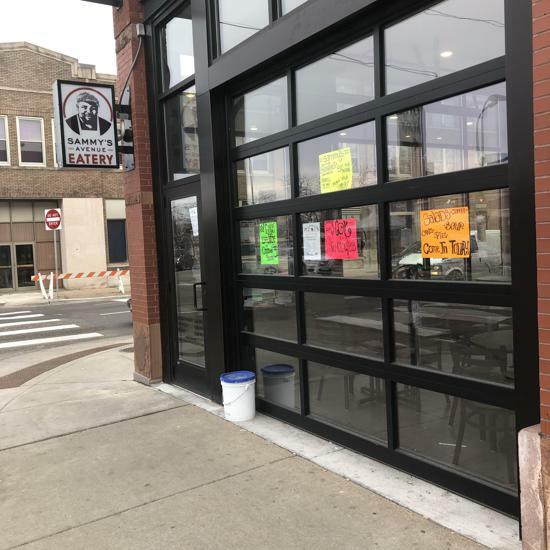 Offering Brownies, cake jars, pies, and cover/stuffed fruit. Offering Massage, table candles, and Energy Work. Offering Hand Made Jewelry and Things. 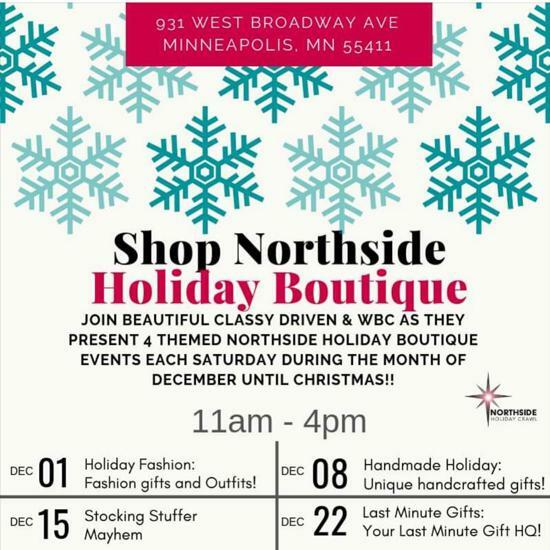 The Northside Holiday Crawl is an evolution of Northside Holiday Boutique pop ups (since 2013) and Black Friday on Broadway (since 2016). 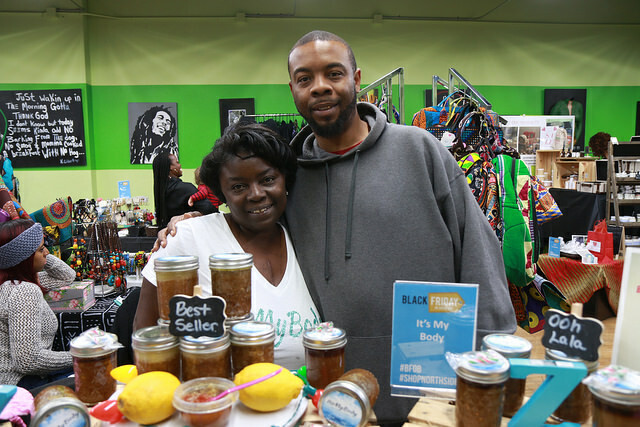 In 2017 WBC, BLEXIT, NEON, ABEP and many other partners worked to boost sales and raise awareness of entrepreneurs and small businesses on the Northside, expanding the one-weekend event from Glenwood to 44th Ave. N. In 2018 we are expanding again to 6 weeks of events and promotions across North Minneapolis.